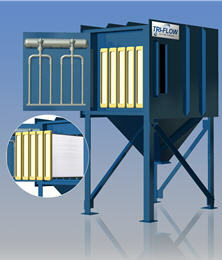 Tri-Flow is a filtration concept delivering HEPA-like performance. Compact filters provide 2-3 times more filtration compared to similarly dimensioned bag (pocket) filters and are typically rated MERV 10-13. There are 7 filter media, including options for oleophobic, high temperature and anti-static applications. All media is pleated and continuously bonded for maximum dimensional stability and filtration integrity. A rigid base molding protects the elements; a resilient mounting flange provides a dust seal that prevents bypass.